Duane Stevens '98 returns a blocked point after attempt for a safety in Saturday's game against Assumption College. MIT won 34-30. 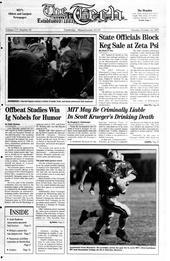 Quarterback Scott Blackburn '99 scrambles across the goal line to score MIT's third touchdown. MIT beat Assumption College 34-30 on Saturday afternoon. Tracy Sadowski '99 attempts to steal the ball from an opponent in Thursday's game against UMass-Dartmouth. MIT won the game 4-1. Numerous student groups erected a memorial on Friday in Lobby 7 honoring the lost cultures of pre-Columbus America.